Ho Chi Minh City authorities should wake up creativity of 10 million residents who are the huge human resource for the city development, said city Party Chief Nguyen Thien Nhan during a conference on building HCMC into innovative city. The municipal authorities have already established its intention to ‘encourage creativity among the public for urban development in the period from 2018 – 2020 and further’. As said by Secretary of HCMC’s Central Party Committee Nguyen Thien Nhan, most of the existing trouble in the city could be tackled if this creativity is at its full power. It is high time that the local government fostered innovation movements among all laborers as well as the authorities. Learning from real examples of successfully developed cities thanks to their innovation force, which possesses the three specific features of Technology, Talent, and Tolerance, HCMC is going to focus on transforming itself into a city with high-quality living standards. This is supposed to attract and then retain sufficient talented human resources. According to Mike Douglass from Hawaii University of the US, a good city for living owns these three natures: a good natural environment, a good urban environment with effective interactions between residents and the authorities, and good self-development (meaning the ability to invest into the growth of human beings in a safe environment). This thinking is corresponding with the theory of urban development via economy, society, and environment, with a better focus on humans themselves. HCMC wants to become an attractive location with low unemployment and homelessness rates. It wishes to provide its residents with proper public services like healthcare, education, entertainment, and green space. Along with the plan to improve living standards for citizens, HCMC aims at forming many innovative urban areas, serving as the main force for urban development. Having appeared lately in a policy-making discussion in the US, the concept of an innovative urban area has been widely accepted globally. This area should include leading educational institutes, businesses which are closely connected with startup people and incubation centers. This small-scale area should also have advanced infrastructure as to transport and working space, accommodation, shopping centers. At the moment, HCMC is planning to build one such zone, called ‘Urban Area 4.0’, in a part of District 2, District 9, and Thu Duc District. This zone is supposed to be the light of a larger region including HCMC, the provinces of Dong Nai, Ba Ria – Vung Tau, Binh Duong, Binh Phuoc, Tay Ninh, Long An, and Tien Giang. It is hoped to be a node in the global economic network. 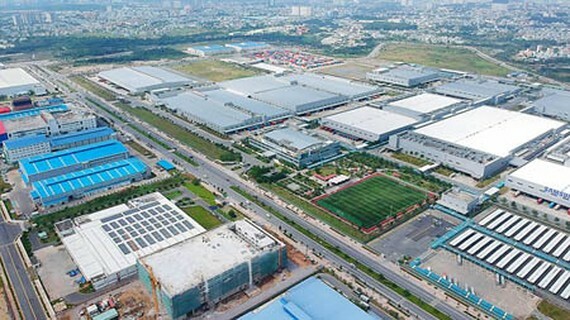 In order to gain enough creativity power and to meet demands of Industry 4.0, HCMC has already invested into a 700-ha high-tech park in District 9, making it the national leader in the era of industry revolution. This park is also the place to build the innovative startup ecosystem of the whole region, named ‘Vietnamese Silicon Valley’. 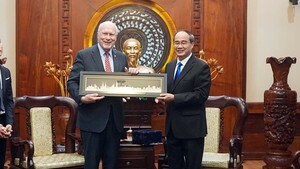 Many prestigious international projects of Intel Group (the US), Nidec and Nipro (Japan), Samsung (South Korea), Datalogic (Italy), Sanofi, Schneuder Electronics (France) are carried out here, greatly contributing to the economic growth of HCMC in particular and of the whole nation in general. As a result, the park is now in the list of international high-tech areas. A science – technology urban area is a place to attract technological investment and leading professionals, to foster the implementation of information technology, advanced inventions into the real life in order to improve the localization rate of products. This is also a place for high-quality human resources development, international collaborations, global research and technological transfer, creating more scientific parks in neighboring areas, encouraging economic structure transform from a wide-scale model to a deep-scale one. In the 30 years of innovation, HCMC has always been the national leader in development and reshaping its economy structure while ensuring social security and welfare. In the new era, it is necessary that the municipal authorities renovate themselves to better serve the citizens. In order to effectively manage the city, the urban authorities need to adjust certain legal regulations, to encourage the participation of the public, to be more transparent in administrative procedures. These are to ensure justice and effectiveness. The state managers should also prepare a clear strategic vision for the future. It is, therefore, essential to build an e-government to fully exploit advanced technologies and create more breakthroughs in administrative procedures. Simultaneously, to serve Industry 4.0, human resources need more attention in order to have the capability to compete with their international counterparts. To fulfill this goal, there should be various training sessions, synchronous policies to attract the talented and scientists. There should also be an encouragement of startup activities among all ages in the city. Thanks to such proper programs like providing high-quality living standards, constructing innovative urban areas, building a creative local government, it is obvious that HCMC will enjoy its spectacular success.